Introduction: Evidence-based medicine requires systematic access and appraisal of contemporary research findings, followed by their application in clinical practice. It assumes an even greater significance in the current era of aggressive, industry-driven marketing. Methods: A questionnaire was designed combining the McColl questionnaire and Barrier scale with relevant modifications and was administered to the urology trainees attending a continuing urological education program. Statistical analysis was performed using SPSS version 25. Results: The meeting was attended by 110 urological trainees from 55 urological training centers all over India. One hundred and three of them agreed to participate in the study. About 92% of the questionnaires were fully completed. Less than half of the participants (47%) had access to reliable urological literature at work. Only 11% of the respondents claimed to have been formally trained in evidence-based urology (EBU). The inability to understand statistical analysis was the most common (67.4%) perceived barrier to EBU. Conclusion: The urological trainees in India are positively inclined towards EBU. The lack of formal training in appraising the available literature and lack of protected time, and portals to access the literature at workplaces hinder them from improving their compliance to EBU. Evidence-based medicine (EBM) is the process of systematically seeking, appraising, and using contemporary research findings as the basis for clinical decisions. It assumes an even greater significance in the current era of aggressive industry-driven marketing. The lack of awareness and knowledge about EBM and its principles also result in practices that are not supported by the best available evidence. This study aims to assess, for the first time, the attitude of the urology trainees in India towards the practice of evidence-based urology (EBU). This was a questionnaire-based prospective study. The McColl questionnaire has been used extensively to study the attitude of the medical practitioners towards EBM. It is also a tool in gauging their basic understanding of common terms and their ability to access databases to practice EBM. The BARRIERS scale, on the other hand, assesses the responder's perception as to why he or she finds it difficult to practice EBM. We designed a questionnaire combining these two with relevant modifications and administered it to all the urology trainees attending a continuing urological education program. The study had obtained the scientific and ethical clearance from the Institutional Review Board (IRB number–10925/18). Data were entered using EPIDATA software and screened for outliers. Summary statistics was used for reporting demographic characteristic. Categorical data were expressed as number (Percentage) and were compared with the Fisher's exact test. Continuous data were expressed as mean (standard deviation) and were compared with the independent samples test. Differences were considered statistically significant at P < 0.05. All the statistical analyses were performed using SPSS version 25 (Armonk, NY, IBM Corp). The meeting was attended by 110 urological trainees from 55 urological training centers all over India. One hundred and three of them agreed to participate in the study. About 92% of the questionnaires were fully completed. The majority (61.2%) of the candidates were positively inclined towards EBU. However, 58.3% of them felt that their coworkers were not as inclined to EBU as they were, a finding which was statistically significant (P = 0.007). The fact that EBU improves patient care was strongly agreed on by 91% of the residents. It was also believed, by 62% of the respondents, that the practice of EBU is an added burden to their clinical practice. The majority of the respondents considered that only 60% of the current clinical practice is evidence based. Only 11% of the respondents had received some formal training in EBU. To evaluate the trainees' grasp on commonly used statistical terms, a list of ten valid and two dummy terms were administered. “Absolute risk” and “relative risk” were the two terms understood by 90% of the respondents. However, the terms “publication bias,” “heterogeneity,” and “number needed to treat” were poorly understood [Figure 1]. In all the instances, it was interesting to note that the candidates who were uninformed about the terms also showed an interest in learning about it. Less than half of the participants (47%) had access to the PubMed (Medline Database) at work. About 55% considered the library to be the most common place to access PubMed, and 54% accessed it at home. A literature search was performed >25 times in the past 1 year by 69% of the participants, and about 64% had performed it in the past 1 month. Among all, 53% of the respondents followed clinical practices of their colleagues or seniors instead of EBM, whereas 41% sought and applied evidence-based summaries. Only 48% of respondents claimed to appraise the primary literature themselves. About 64% of the trainees were eager to acquire the skill required to interpret EBU by themselves in the future. The seven most common reasons preventing the residents from practicing EBU are listed in [Figure 2]. The inability to understand statistical analysis was the most common reason (67.4%). 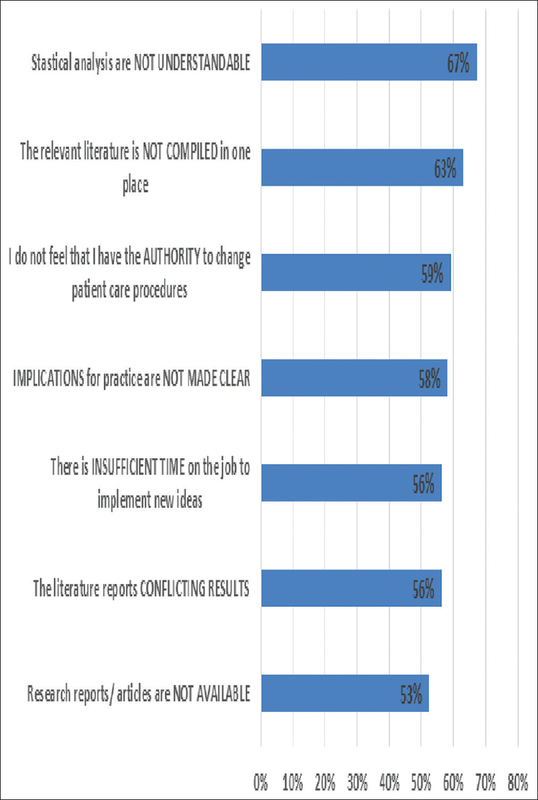 The lack of a centralized source of literature (63.1%) and the perceived lack of authority to change the existing practices (59.2%) were the other reasons. The majority of the residents felt that they were aware of the research and its relevance to their practice. This study gives an insight into the perceptions and attitudes the urology trainees in India have towards EBU. The inability to understand statistical analysis was the most common perceived barrier to practicing EBU. One of the lesser understood statistical terms was the number needed to treat (NNT). As it is an important concept affecting treatment decisions, its understanding allows the residents to choose the treatments which have a sizeable benefit, thus avoiding unnecessary treatment. The importance of the NNT in treating some common urological ailments is illustrated in [Table 1].,,, Another poorly understood concept was “publication bias.” The residents need to understand the possible implications of this bias which results in preferential publication of studies with positive findings or incorrectly highlighted research findings. The report on port-site metastasis is an example of publication bias which highlights a possibly incorrect interpretation of findings. A similar bias might be preventing the publication of possible benefits of phytotherapy for symptoms of benign prostatic enlargement in the English predominant world of medical literature [Table 2]. As used by Knops et al. and Mittal and Perakath in their studies, the fact that the dummy terms were not understood by most of the respondents, ruled out socially desirable answers, thus adding reliability to our questionnaire. There is an unmet need for dedicated training in systematic searching, appraising, and practicing EBU, as less than one-fifth of the trainees reported prior exposure to the process of critical appraisal. Our study revealed that less than half (47%) of the trainees had an access to urological literature at their workplace. Roth and Siemens, in a similar study among Canadian urology residents, found that only 10% of them considered access to EBU sources as a barrier to its practice. This brings to light a definite need to provide more portals of access to urological literature. Only half of the participants (48%) appraised scientific urological literature themselves. The fact that two-thirds of them were strongly willing to adopt the evidence-based way of practicing urology in their future practice was encouraging. The response to the perceived barriers to the practice of EBM in our study was similar to that of the general surgery trainees in India. Roth and Siemens also found similar limitations in understanding the urological evidence amongst urology residents in Canada. They suggest that EBM ought to be incorporated early into the urology training curricula. Journal clubs with a detailed discussion of available evidence in the form of classic papers and contemporary papers, along with systematic reviews should become a routine practice at least once a week. Structured training, in the form of dedicated workshops during conferences is required to educate the residents in critically appraising available evidence. Every teaching department needs to provide its residents an environment conducive to access, appraise, and implement the latest evidence-based practice guidelines in their day-to-day practice of urology. Residents who follow this regularly should be acknowledged and appreciated so as to give them an incentive. The exit examination of the residents should also include assessment of their understanding and interpretation of scientific evidence. The urology training program in India requires a residency in general surgery followed by 3 years of training in urology. Since most of the respondents in the study were final year residents, this study may not represent the attitudes and perceived barriers of the first and second year urology residents due to differences in work schedules. This gives a sound reason for a similar survey at a national scale to assess their attitudes. As inherent to any questionnaire-based study, this study had similar limitations of subjective interpretation of the various questions among the respondents. Although the bias from socially desirable answering was ruled out by the use of the “dummy” technical terms, the potential for this bias always remains. We tried to eliminate it by keeping the questionnaire anonymous. Another limitation of this study is that the respondents' claims regarding lack of access to literature at their workplaces could not be verified. The urological trainees have a positive attitude towards EBU. However, various factors such as their own perceptions to EBU, lack of formal training in appraising the available literature and lack of protected time and portals to access evidence at the workplace hinder them from improving their compliance to EBU. The regulatory boards for training, the trainers and all the trainees need to acknowledge and address these issues to ensure improvement. A firm commitment is of utmost importance to make EBU a way of life than just a concept. Rosenberg W, Donald A. Evidence based medicine: An approach to clinical problem-solving. BMJ 1995;310:1122-6. Kekre NS. Evidence-based urology: Overrated or need of the hour. Indian J Urol 2011;27:435-6. McColl A, Smith H, White P, Field J. 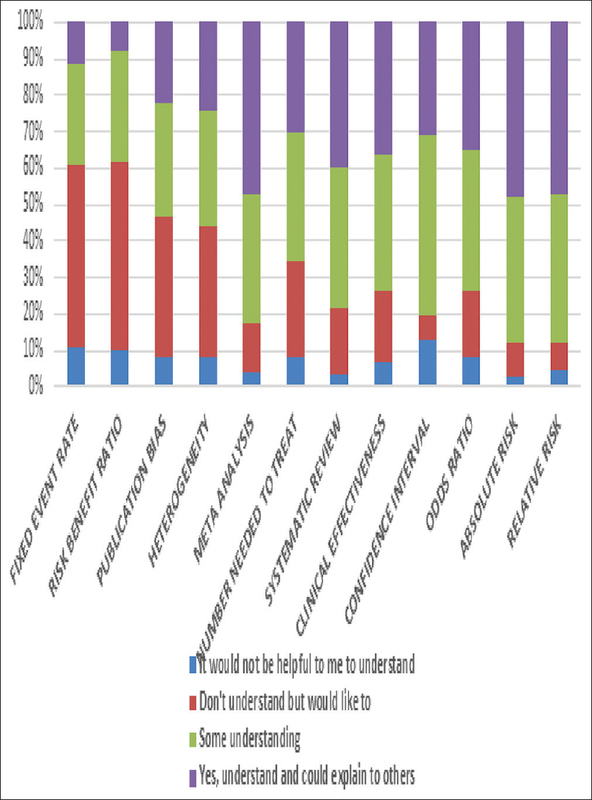 General practitioner's perceptions of the route to evidence based medicine: A questionnaire survey. BMJ 1998;316:361-5. Funk SG, Champagne MT, Wiese RA, Tornquist EM. BARRIERS: The barriers to research utilization scale. Appl Nurs Res 1991;4:39-45. Mittal R, Perakath B. Evidence-based surgery: Knowledge, attitudes, and perceived barriers among surgical trainees. J Surg Educ 2010;67:278-82. Hoffman RM. Clinical practice. Screening for prostate cancer. N Engl J Med 2011;365:2013-9. RIVUR Trial Investigators, Hoberman A, Greenfield SP, Mattoo TK, Keren R, Mathews R, et al. Antimicrobial prophylaxis for children with vesicoureteral reflux. N Engl J Med 2014;370:2367-76. O'Brien T, Ray E, Singh R, Coker B, Beard R; British Association of Urological Surgeons Section of Oncology, et al. Prevention of bladder tumours after nephroureterectomy for primary upper urinary tract urothelial carcinoma: A prospective, multicentre, randomised clinical trial of a single postoperative intravesical dose of mitomycin C (the ODMIT-C trial). Eur Urol 2011;60:703-10. Schröder FH, Hugosson J, Roobol MJ, Tammela TL, Zappa M, Nelen V, et al. Screening and prostate cancer mortality: Results of the European Randomised Study of Screening for Prostate Cancer (ERSPC) at 13 years of follow-up. Lancet 2014;384:2027-35. Tseng TY, Stoffs TL, Dahm P. Evidence-based urology in practice: Publication bias. BJU Int 2010;106:318-20. Jancke G, Aljabery F, Gudjonsson S, Hosseini A, Sörenby A, Wiklund P, et al. Port-site metastases after robot-assisted radical cystectomy: Is there a publication bias? Eur Urol 2018;73:641-2. Nartey L, Huwiler-Müntener K, Shang A, Liewald K, Jüni P, Egger M, et al. Matched-pair study showed higher quality of placebo-controlled trials in western phytotherapy than conventional medicine. J Clin Epidemiol 2007;60:787-94. Knops AM, Vermeulen H, Legemate DA, Ubbink DT. Attitudes, awareness, and barriers regarding evidence-based surgery among surgeons and surgical nurses. World J Surg 2009;33:1348-55. Roth K, Siemens DR. The status of evidence-based medicine education in urology residency. Can Urol Assoc J 2010;4:114-20.